A little more than three years after my dad died, my brothers and I finally retrieved what boxes of his stuff remained in his wife’s garage. We split it three ways, arbitrarily. The plan was to give each box a cursory sorting to pitch the garbage that was undoubtedly in some of them, thereby minimizing what we’d each need to store. I expected to find lots of crap in those boxes, and Dad didn’t disappoint. Some of the gems from my boxes? Half-used post-it notepads and a staple remover. I am also now the proud owner of more drafting gear than any one person should own, especially now that basically no one does drafting using a paper and pencil anymore (anyone need a small collection of triangles?). One of my boxes, however, contained treasures beyond anything I could have imagined. I have my father’s old passports, in addition to the passports of his parents. I have postcard books they bought on trips to Rome, Paris, and Israel. I have the documentation from when they sailed from Spain to New York in order to escape the Nazis, after a 5-year period of living like gypsies with relatives in France and then being helped across the border by some Basque people. And I have what I believe are journals my Oma – my father’s mother – kept starting the year my father was born (1935) and chronicling the next several years, including (I assume) the family’s exodus from Europe and arrival in New York. There are two notebooks, and they’re almost completely illegible to me. 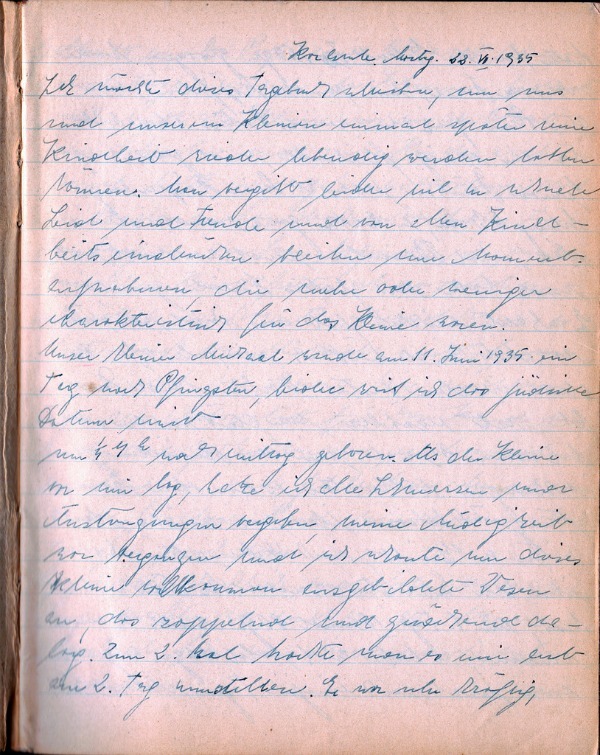 I can make out a date here and there, and I recognize my father’s name and birthdate on the first page of the first book, but it’s more than old handwriting that’s holding me back – they are in German. And I’m told that some older handwritten German documents are in a version of the language that’s tough for Germans today to even read (think Olde English). Any German speakers out there want to tell me if that’s even readable? Here’s a link to the page on Flickr, if you want to look at a larger version of it.